Björck Collection; sale, Stockholm, 6 December 1922, lot 73. Paul Vredeman de Vries was the son and pupil of Hans Vredeman de Vries, one of the most influential exponents of Mannerist architecture and decoration; indeed, Paul collaborated on one of his father's many volumes, Architectura (1606), contributing 31 engravings. It was engravings of this type that would be such a rich resource for later artists, Hendrick van Steenwijck I (who was also taught by Hans Vredeman de Vries), Bartolomeus van Bassen, and Dirck van Delen. Like the engravings, Paul Vredeman de Vries's painted architectural fantasies, such as the present lot, allied a wealth of elegant architectural forms with a clever illusion of space. 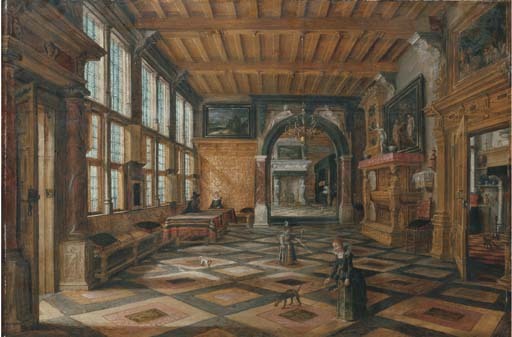 Such interiors particularly appealed to the aristocratic and intellectual clientele that gathered around the courtly cities of Antwerp and Prague. Other examples are at Vienna (Kunsthistoriches Museum), The Hague (The Mauritshuis), and Paris (Musée des Arts decoratifs).